It’s officially that time of year again- we are set for the NBA Finals or more recently known as the Golden State vs. Cleveland series. Game 1 of the Marquee Matchup will tip tonight and for the fourth consecutive year, we will see the likes of Steph, Klay, KD and LeBron go head to head. The preceding sentence marks the biggest problem for the Cavs. They are taking on a (at many times) three headed monster that even the King himself was not able to slay last season. Ironically, we all know basketball is a team sport- but the heroics we have witnessed James display during this playoff run, makes it pretty tough to rule his team out just yet. The mentality for Cleveland’s locker room has GOT to be one game at a time. In fact, with GSW’s proven ability to have opponents stop, drop and roll so suddenly during quick game spurts, Tyronn Lue may even want to break it down to a more quarter at a time focus. It is almost alarming that Cleveland, the most inconsistent playoff team this season, has managed to reach the Finals. But this also shows how good the Cavs can be when the single most powerful weapon of mass destruction the NBA has ever seen (yep you read that right) is able to perform but also get some assistance from his teammates. In particular, there is one teammate that LeBron would probably LOVE to be playing alongside sooner then later. Is Love In The Air For the Finals? Did you get that hint? Kevin Love bumped heads with Jayson Tatum in Game 6 of the Eastern Conference Finals against Boston last week. The Q, along with Cavs fans around the world, nervously looked on as it took a couple of minutes for the five time NBA All- Star to get off the court with some assistance. Love has sat out in previous seasons and this current one with head injuries, so this maybe a little worse then the organization would like to lead the public to believe. The argument is clearly that the Cavs went on to win both Games 6 and 7 against Boston without Love, and that he may be a defensive liability against a run & gun Warriors offense. However, Love is Cleveland’s second scoring threat, averaging 13.9 ppg during the playoffs, and listed at 6-10, the C/F is a perimeter threat. Cleveland is best when LeBron touches the paint and either displays a monster finish or kicks the rock out to a hot hand ready from downtown. Kevin Love has the ability to hit and has to be guarded from long range, thus stretching the D, creating space and becoming a viable scoring option. However, Love’s return still remains questionable for Game 1 and possibly for the entire series. Love’s return to play is not the only factor that will have an impact on this series. George Hill is a key player in the matchup. Not only will he have to show consistency on O – running in transition, playing off the ball when LeBron wants it- and knowing when to step in and QB when he doesn’t, but also defensively taking on one of the toughest tasks in TRYING to disrupt Steph Curry. It’s a fact that the 32 year old vet is experienced, being drafted in the first round in 2008 by Gregg Popvich’s San Antonio Spurs. Obviously the Cavs will take as much offensive production out of Hill they can get- but the focus might shift in attempting to take away court vision, passing lanes and contesting Curry’s shot attempts that are high clips from what seems like anywhere half court in. Tristan Thompson will have to continue to be a complete beast around the rim- he eats rebounds for breakfast, lunch, dinner and snacks in between. Thompson has a rep for giving his Cavs extra possessions generated from a brilliant combination of his size, skill and flat out tenacious mindset in the offensive rebounding column. Cleveland almost desperately needs Thompson to get out there and do what he does and secure the ball- this will help the team control pace which is pivotal to success against Golden State. Sharpshooter Kyle Korver- as in one of the best to ever do it, must connect when the ball is in this hands. His presence on the court is important to the Cavs as teams rarely make the mistake – which is often a miscommunication- on leaving him with a good look from long range. However, it does happen and the 37 year old has made a career from making opponents pay. Korver can be seen as another defensive liability so it puts more pressure on him to connect at a high clip when he gets looks. Kyle is mesmorizing to watch when he catches in rhythm, whether that be in transition or off a screen- it’s automatic, muscle memory, beautiful release and there in no group yearning to see that more then the Cleveland Cavilers. JR Smith is another shooting vet that will have to continue to take shots, but its the NBA Finals, he has to make them too. Newer faces within the organization- the likes of Jordan Clarkson, Jeff Green and Larry Nance Jr are going to have to give a little more. While it is unrealistic to expect any of these guys to step up and steal the show- if they can contribute a bit more it could possibly lead to a couple more W’s on the season. Reality is, the Cavs are missing the playoff production of Kyrie Irving big time (he averaged 29.4 ppg in this series last year- it still wasn’t enough) and while it’s very hard to replace those numbers, if everyone gives just little bit more scoring and energy, it would give Cleveland a MUCH better chance to compete. Do The Warriors Have Any Flaws? Golden State is coming into this year’s championship fresh off a very competitive Western Conference Finals where they edged out Houston in Game 7. The Warriors have not been challenged like this in a playoff series anytime recently- they held a post season record of 16-1 last year before hoisting the Larry O’Brien Trophy. It was quite interesting to see Golden State- with this historic core- look somewhat vulnerable at times during the last two weeks. There is no doubt that Houston was assembled to win this series – and had Chris Paul’s hamstring stayed in playing form, it may have actually happened. But it didn’t. It’s hard to find consistent flaws with the Warriors. Andre Iguodala is listed as out for Game 1 (knee) and he is one of the lead defenders against LeBron. However even with the absence of the undersized big, GSW is just the better team. Steph is incredible, KD is a superstar, Klay is amongst the top shooters in the league and Draymond Green is relentless at all times. 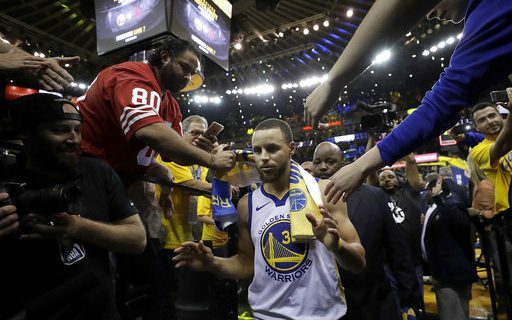 In the final weeks of a treacherous and gruelling NBA season, balance is maybe the single most important element to a Champion caliber roster and the Warriors continue to own that. Cleveland’s margin for error in this series is as small as ever and so many of the above factors have to come into play for them to compete. GSW is going to get hot, they are going to go on incredible runs. Cleveland must prove the ability to respond with the most consistent high powered O this fairly new assembled roster has ever put together, and LeBron will not be able to win the race to 4 games alone or even with minimal contributions. I originally wanted to say GSW in 5. However, I am still sitting here in awe, watching the playoff run that James has put together. It’s magnificent that he has been able to guide this roster- this year- to another NBA Finals appearance. There have been countless times during the playoffs this year (particularly during Round 1 vs Indiana and recently Boston) where I thought the Cavs would be fishing or golfing or whatever within a couple of days- yet here they are- 1 of 2 still standing. One of the most scrutinized players in NBA History continues to show up – continues to dominate and continues to generate Finals’ appearances’- so I’m giving him a game. Golden State Warriors in six games. Bob Gaughan also has some thoughts on the start of the NBA Finals.